Lately, some of the most common questions in our house are "Mom, do you know where this country is?" Or "I heard about this place on the news/in school, how far away is it?" And with the Olympic Games this summer, I imagine that we'll have a lot more of these geographic questions. My response "Let's find it on the map." 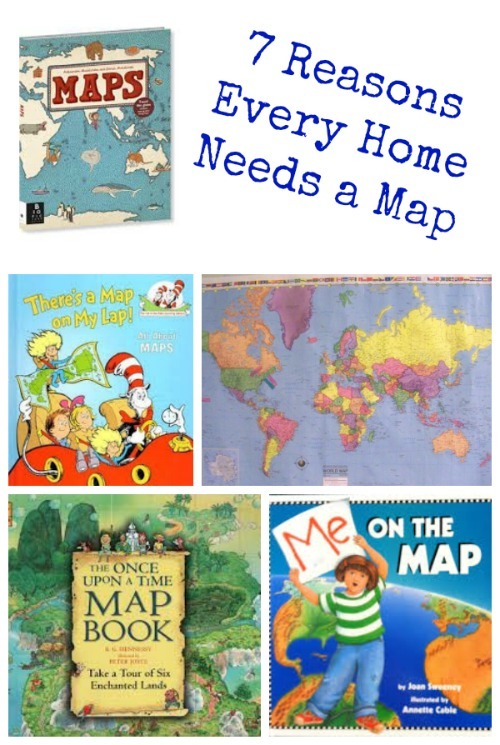 To inspire the kids to look at a map more often, here are 7 easy ways to use a map or globe in your home along with mapping resources and affilaite links for items we recommend. They help kids to see the big picture of the world and how our city, state or country is just a small piece of a larger planet. There's a wonderful book titled Me on the Map (Dragonfly Books) where a child shows a map of her room, and then a map of her room in her house -- it continues to show the locations of her town, state, country so the reader is able to get an idea of where they might be 'on the map'. Use pictures of family members and post them close to the city/state/country where they reside. Kids will begin to appreciate just how far people travel to see them. For military families, kids will have a better idea of where their loved ones are stationed. It's always fun to see how far away you'll be from home! Put a small dot or tack on all the places you visit and by the time your kids are teenagers, they'll have a great visual of how 'worldly' they've become! Another fun game to play is to locate places on the map that kids are currently reading about in books. My daughter and I are reading "Pippi", so finding Sweden on the map is a must. It also helps kids begin to learn about real locations and fantasy places - even fiction books mention real-life places. See our Map Your Summer Reading activity for more details! If you like the idea of connecting books to geographic locations, you'll love the Booking Across the USA series -- 50 states, 50 kids books, 50 activities! There are so many places that kids hear about in school, on the news, and during conversations at the dinner table. Whether it's a tsumani in Japan, finding countries that are conserving rainforests, or learning where US troops are being deployed - maps help us to add context to the news. There were 205 countries competing in the 2012 Summer Olympics - challenge your kids to locate them all on the map! When you learn about other places and cultures, kids begin to think about what it would be like to live or visit other locations. My son is already planning to retire in Fiji! Another wonderful book about maps is The Once Upon a Time Map Book: Take a Tour of Six Enchanted Lands . Children will enjoy exploring maps that show the worlds of Peter Pan's Neverland, Alice's travels through Wonderland, Dorothy's visit to Oz and more fun places from famous books! For example, there were snowy owls visiting our region this winter which is a rare thing - a map helped us to show kids the natural habitats of these animals, migration patterns and explain which animals are native to an area and why. Other fun migrations to follow on the map include monarch butterflies and hummingbirds. Maps will help you explain why your kids probably won't see a moose in your backyard, but how they may see an arctic owl or a fox. Don't sweat it if you don't have an up-to-the-minute map of everything. Our world is ever changing. But having a physical item (globe or map) that kids can label, touch and interact with is a great learning opportunity in so many ways. Try this version if you'd like a wall map that you can use post-its or label with dry erase markers. An atlas is always a great option if you don't have the wall space for a map. For a fun & inexpensive option, try a placemat for the table. If you can find it, get one that has a world map on one side, and a map of the U.S. on the opposite side. If you're looking for a globe, try this cool option! This huggable, soft globe can be used as a pillow or a map :-) Kids will love interacting with it! 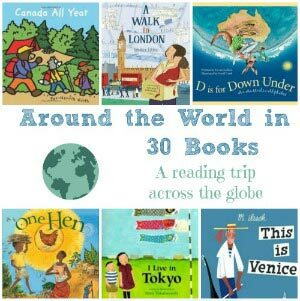 If you love taking virtual trips around the world, be sure to see our other book lists too! Love it! My kids love looking at maps. Before I had children, I bought a map with little pins so that I could mark the places in the world I had visited. It hangs over our fireplace and the kids LOVE it. We also have a couple they can play with on the floor. Two other recommendation I have for maps and globes are the play map by FAO Schwarz. It is a felt material with velcro labels for the continents and animals from around the world. I also LOVE the talking globe I have for my kids. It was expensive but absolutely worth it. I think I got it from National Geographic, but I am not sure. It has an attached pen. You push the country and it can tell you its name, capital, population, language, and more. We have a large map on our wall, it comes in VERY handy! There have been many questions about city are we in and where people or places are lately. Danielle - I love the idea of having the map in the main living area! How fun to share your travels with them. And thanks for the recommendations on those 2 other maps - I bet kids enjoy the interactive nature of the the talking globe. Great ideas, I will incorporate this with my unit about Space in reference to learn about our Earth. My kids are obsessed with maps. They esp. like their map puzzles.